This clearly matches the type of munition used in the Sarin attack on August 21st, which I dubbed the UMLACA (unidentified munition linked to alleged chemical attacks). Previously it's been established there's at least two types of these munitions, explosive and chemical, and possibly two different sizes. I suspect this version might be the larger type I believe is launched from a single barrel launcher shown in a video published on August 28th. The smaller type is launched from twin-barrelled launchers, as seen at the government controlled Mezzeh airbase at the end of 2012. 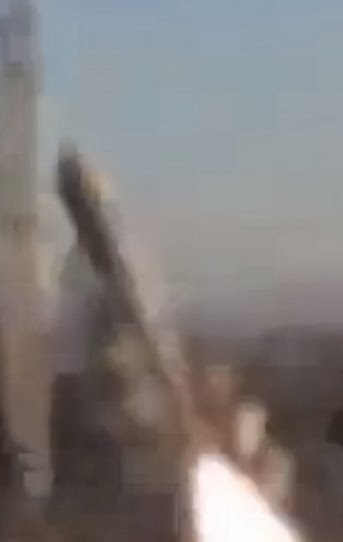 It seems that with this video, and other evidence gathered over the past couple of months, it now seems undeniable that the Syrian military has been using this family of munitions for at least the past 10 months. During the discussion of the range of the munition, the aerodynamics of the warhead appears to be a significant factor in the range of the munition, and it appears some examples of the munition have been shown with a rounded nose, which is significant when calculating the possible range of the munition. While not quite as significant, this video also contains another example of the Syrian military using IRAMs. More posts on the subject of the August 21st attacks can be found here, and other posts on chemical weapons and Syria, including extremely informative interviews with chemical weapon specialists, can be found here. Thanks to John Minthorne, who has put together this detailed analysis of the range of one munition type used in the August 21st Sarin attack. John Minthorne is a professional mechanical engineer with around seven years relevant experience. His relevant experience includes process system design, project management, feasibility and conceptual studies, and computational fluid flow modelling. The original report and associated files can be found here. This report attempts to establish, with a minimal level of rigor, the maximum range that can be assigned to the 330mm-class chemical rocket (the "unidentified munition linked to alleged chemical attacks [UMLACA]) used in the August 21, 2013 attacks on Ghouta, Syria. The report is based on public information including United Nations reports, NGO publications, amateur video & photography of the remains of the weapons, public weather data. In particular, this goal of this report is to determine whether this model of rocket could have been launched from the Syrian Army Republican Guard "base 104", approximately 9.5 km west of the impact sites. In the early morning of August 21, 2013, the Ghouta residential suburb of Damascus, Syria was struck by a rocket attack that killed hundreds. Representatives of the Syrian Army and rebel forces were quick to blame one another for the attack, and international observer countries including France, the United Kingdom, Russia, and the United States made official but predictable statements blaming the "opposite side". In mid-September, Human Rights Watch (HRW) and the United Nations (Sellström) released reports that confirmed the August 21st attack did make use of Sarin. Consistent with the UN Mission's charter, the Sellström report did not assign blame for the attacks. The report did, however, note the azimuth of the ballistic trajectories of two of the munitions used, including a UMLACA that impacted Ein Tarma. The Human Rights Watch, along with several news organizations, noted the the trajectory azimuths intersect deep in Syrian government-held territory, specifically the Republican Guard 104th Brigade military base. However, this information is only meaningfully damning to the Syrian government if the UMLACA is capable of being fired approximately 9.5 km from the Republican Guard base to the impact site. Much of the flight path less than 8 km from the impact site is identified by Human Rights Watch as "contested" at the time of the launch (Lyons). Assuming very short burn times (and wrongly stating that such an assumption is conservative). Drag increases as a function of more than the square of the velocity, and as a result the thrust of the rocket motor over time is a crucial consideration. Using hobby rocketry engines as the basis of design. By extension, underestimating the propellant mass and specific impulse. Miscalculating the center of drag, severely underestimating the rocket's stability. Failure to consider wind direction, elevation above sea level, or air temperature. Published photographs and diagrams based on those photographs, by Human Rights Watch. Field measurements and photographs taken by the United Nations Mission. Secondary sources of ballistic error such as Coriolis forces are ignored. Additional assumptions are listed in the relevant sections of this study. The total impulse of the UMLACA rocket motor is limited by the propellant selected and the volume of propellant used. Since the purpose of this study is to evaluate whether a 9.5 km travel distance can be ruled out, each physical assumption is listed as a range between which the actual values for the UMLACA likely fall. The total length of the UMLACA is about 2200 mm. Some portion of the nose section is filled with a bursting charge and detonator, so the maximum length of the solid fuel volume is assumed to be 2000 mm. The UN report implies that the motor section may be as short as 1340 mm, so a more pessimistic assumption incorporating a void space inside the weapon's warhead would be a fueled length of 1300 mm. The external diameter of the UMLACA is 120 mm. Assuming a robust, wall thickness consistent with standard weight pipe, an internal diameter of 110 mm is used. This results in a volume range of between 0.0124 and 0.0190 m3. The density of high-performance solid propellants varies between 1.6 and 1.86 kg/L (Zandbergen). Applying this value range to the fuel volume range, the rocket's propellant mass is found to be between 19.8 and 35.34 kg. The specific impulse of a rocket motor will have a profound effect on its performance. As a motor becomes more efficient, it can increase the final velocity of a rocket exponentially higher. This effect is more muted in a subsonic or transonic rocket than in an orbital or sounding launch vehicle, however. Military propellants have specific impulses in the range of 210 to 260 s (2060 – 2550 N*s/kg) (Zandbergen). Multiplying this range by the propellant mass gives us a total impulse for the UMLACA of 40800 to 90100 N*s.
Gases escape a rocket nozzle in a predicable fashion. The fluid flow velocity through the nozzle throat is Mach 1, such that the total thrust generated by a rocket motor varies roughly proportionally to both the chamber pressure and throat area (Platzek). Unfortunately, no information appears to be publicly available documenting the precise the throat area of the rocket motor. The Human Rights Watch report contains one photograph of the rear of the motor and a tape measure, allowing estimation of the nozzle throat to be very roughly 50 mm. Assuming a chamber pressure of 7 MPa, this would equate with a maximum thrust of around 22 kN. Given the very large amount of uncertainty on this number, no conclusions can be drawn from this. It is simply noted that the estimated maximum possible thrust is within an order of magnitude of the thrust a designer would desire for this weapon. A solid-fuel rocket has a practical maximum burn time – the regression rate of propellant is lowest in a solid grain geometry, but is still non-zero. 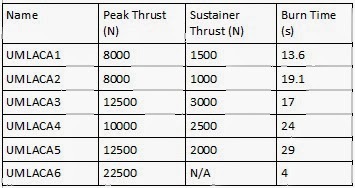 Regression rates for typical high-performance propellants vary from 5 to 25 mm/s (Zandbergen), corresponding to a theoretical maximum burn time of 80 s to 400 s for a 2 meter, solid grain rocket motor. The longest total burn time considered in this study was 45 s, well within the realm of feasible achievability. The amount of thrust a solid-fuel rocket provides over the course of its burn broadly customizable by changing the chemistry and structure of the rocket grain. For a rocket with no lift and poor drag characteristics such as the UMLACA, maximum range will be achieved with a short, high thrust initial impulse followed by a long, low thrust burn to sustain velocity at low transonic speed (~0.7M or 240 m/s). A thrust/time profile of this shape is both achievable and commonly found in military rockets (Platzek). A rocket spends a significant amount of time in flight. In evaluating the maximum distance a rocket may travel, the velocity of the wind encountered must be considered. At 2:00 AM on the morning of the attack, the wind at Damascus International Airport was blowing from the WSW (about 248°) at a sustained speed of 6.9 miles per hour (3.1 m/s) and increasing (Weather Underground). Wind speed is typically higher a significant distance above the ground; for the purposes of this analysis the wind velocity is assumed to be an average of 4 m/s from 248° (37° from a pure tailwind from the rocket trajectory of 285°. Correspondingly, a rocket azimuth of 143° relative to a 4 m/s wind was used in the OpenRocket software trajectory models. For ~60 s long flights, this adds a few hundred meters to the range. If meteorological information shows that higher-altitude tailwinds were present, this could increase the maximum range by a high single-digit percentage. Aerodynamic drag is proportional to the density of the fluid through which the projectile travels. The temperature in Damascus at 2:00 AM on the morning of the attack was about 73°F (22.7°C) – if a standard atmospheric temperature of 15° is assumed, drag will be overstated by about 2.8%. The elevation of the targeted area in Ghouta is about 760 meters above sea level – if sea level elevation is assumed, drag will be overstated by about 9.5%. Since the temperature profile of the atmosphere above Damascus is not known, trajectory models assumed a standard atmospheric temperature and a launch elevation of 760 m above sea level. A projectile on a nominally parabolic trajectory will travel a greater distance if its impact location is of lower elevation than if it flies over a flat plain. The topography of northern Damascus is dominated by Mount Qasioun, a 1151 meter high peak. The areas of Ghouta targeted are lower, around 760 meters above sea level. Since the rocket attack was obviously not launched from the peak of Qasioun, the actual difference in elevation was less than 400 meters. This difference in elevation is not considered in these range calculations, since the actual launch elevation is not precisely alleged. This means that the maximum ranges shown are conservative by a small degree (probably 0.1-0.2 km) due to the relative elevations of the launch and impact sites. A model of the UMLACA and derivative UMLACA with a more aerodynamic nose cone were created in the Open Rocket program. Both models were modified from a model downloaded from the whoghouta.blogspot web site. The models are described in the two tables below; dimensions are in mm, roughnesses are in um, and masses are in kg (unless noted otherwise). Any designer tasked with extending the range of the UMLACA would immediately consider improvements to the rocket's drag. With a Cd of about 1.0, the rocket's drag is several times the value to which it could be reduced with relatively superficial modifications. The nearly blunt front of the rocket generates about 80% of the subsonic total drag. 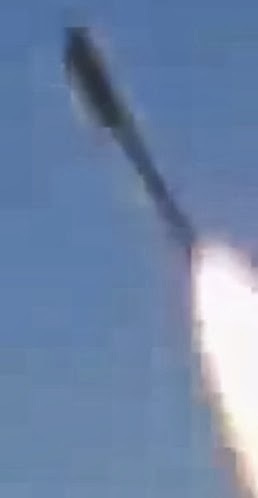 The UN and HRW reports both sketch the UMLACA with a completely blunt end, but the least is known about the front portion of the rocket because it is damaged upon use by the bursting charge and subsequent impact with the ground. The front plate includes six threaded holes which could be used to attach a light-weight aerodynamic nose cone. As such, the possibility that rockets fitted with nose cones were used on August 21 cannot be ruled out. Since addition of an aerodynamic nose dramatically changes the maximum range of the UMLACA, maximum ranges were established both with and without the aerodynamic nose cone. Six hypothetical rocket motors were evaluated, three per drag condition of the UMLACA. All utilized an initial boost phase to accelerate the rocket to about 0.7M (240 m/s), followed by a lower sustainer thrust to maintain flight speed. Two used total impulses of 40800 N*s, the lower end of the estimated motor impulse. The remaining motors used the higher end of the estimated impulse, about 90100 N*s. The full .eng data for each motor can be found here. For convenience, this study matched the "whoghouta" blog's selection of Open Rocket as the software to simulate the UMLACA trajectory. The UMLACA is several times larger than a typical large single-stage hobby rocket, and its characteristic geometry likely challenges the software in ways that were not the focus of its development. The Open Rocket software does not support modelling of a circumferential band around the perimeter of the tail fins. This band is parallel to the air stream, generating significant drag as well as contributing to the stability of the rocket. To model the ring's contribution to drag and efficiency, the fin height was increased from the actual dimension of 95 mm to 135.6 mm, replicating the total fin material area of 0.179 m2. In addition, the enclosed nature of the air stream through the fin assembly may create directional flow effects more pronounced than a more simple fin arrangement. Study of the airflow through this fin assembly is an excellent candidate for further study of the UMLACA's aerodynamics. The UMLACA is likely but not certainly an exclusively subsonic weapon. The coefficient of drag of an object in a fluid flow stream is not constant; it changes with velocity. At about M0.8 the Cd beins to increase, peaking locally at M1.0 and dropping to an intermediate value for low supersonic values (Heinrich). The Open Rocket software attempts to model these changes in Cd, but for a rocket with such an unusual shape as the UMLACA it is likely that the modelled transonic behaviour is not fully accurate. For the UMLACA without drag-reducing features, the maximum distance travelled was about 6.5 km, for the UMLACA4 motor curve at a launch angle of 43° from vertical. Maximum distance travelled using a 41 kN*s motor was about 3.3 km. If the UMLACA weapons used in the August 21st attacked had aerodynamic nose cones, their maximum range could be in excess of 15 km. With a range of 15 km, the UMLACA5 motor curve did not produce the greatest travel distance but its lower average thrust kept the more streamlined rocket at transonic speed (increasing confidence that the simulation is accurate). The rocket with a blunt nose has mediocre drag characteristics. A designer seeking to maximize the weapon's range could add a nose cone to the weapon, which would greatly reduce the drag coefficient and increase the range. The presence of threaded holes on the front plate of the rocket could be an indication that this was, in fact, done. The rocket is aerodynamically stable and unlikely to tumble or excessively oscillate in flight. The publicly available information on the UMLACA (particularly the chemical variant) leaves a large margin of doubt as to the rocket's range and flight characteristics. On the basis of the publicly available information referenced in this report, an attack from the Republican Guard 104th Brigade base cannot be ruled out as implausible. The maximum range of the UMLACA is probably between 3.3 km and 6.5 km, increasing to 15 km if a nose cone were installed. A guest post by Phillip Smyth of Jihadology.net. Videos and images should be considered graphic. Figure : Photo of those executed by Hizballah and posted to social media. On October 8, 2013, the news website, NewLebanon.info released a video claiming to show members of Lebanon’s Iranian-backed Shia Islamist Hizballah, executing what appeared to be wounded men they pulled from the back of a van. The slain men were reported to be Syrians, possibly captured rebels. The video caused controversy with the public and activists alike in Lebanon, Syria, the broader Middle East, and the West. Hizballah has been silent on the issue, but one spokesman said the organization would address the issue. Despite accusations Hizballah had pulled-off the killings, along with audio recordings demonstrating the executioners with Lebanese accents talking about Iranian Revolutionary religious concepts (an important underpinning for Hizballah’s ideology), there was still enough plausible deniability available for Hizballah and other Shia militia groups to argue they had no part in the killings. Nevertheless, after analyzing Shia militia social media pages, I did come across the proverbial, “Picture worth a thousand words” in relation to the execution video: A photo featuring the same men who had been killed in the grainy execution video, were in fact the dead men in another photograph. This picture was uploaded to a prominent pro-Shia militia Facebook page which promotes the “Al-Muqawama al-Islamiyah” (“The Islamic Resistance”). This term regularly describes Iranian-backed Shia Islamist groups with militia apparatuses established in Iraq and Lebanon. It was also of a higher definition than the video recording. Adding to the photograph’s credibility was the fact that it was posted on October 1, 2013; Seven days before the video was released. One of the dead men, the first to be dragged from the van in the video and wearing visible red boxer shorts is in the photograph. Another man, in a white T-shirt covered in blood, was summarily executed in the video. For the photo, he was placed in the pile of the other dead. The man in the striped sweater was taken out of the van at 0.48 and was then shot in the head twice. His destroyed cranium is easily spotted in the photograph and the video. When one follower of the page asked why such a graphic image needed to be posted, the admin responded, saying this would be the fate for anyone who wishes “to abuse Sayyida Zaynab”. Another outspoken member of other pro-Shia militia Facebook sites responded that the dead bodies were the result of, “self-defense”. The admin for the page claims to be located in Tehran, Iran and the page he administers says it is based in Iraq. The administrator is also a prominent poster of graphics which promote the cause of Iraq’s Kata’ib Hizballah, Asa’ib Ahl al-Haq, Kata’ib Sayyid al-Shuhada, and Lebanese Hizballah—all Iranian-backed suppliers of foreign Shia fighters to Syria. These graphics have been widely circulated in these circles, suggesting a more formal link between the administrator and these organizations. After processing around eighty Facebook pages (posts from August 15th-October 23rd ) which promote pro-Shia militia in Syria material, only this Facebook page posted the photograph. When measured against more directly controlled Assad groups on social media, the same photo could not be found. Most interesting was the lack of any type of watermark which would demonstrate the photograph was taken from another website or source. 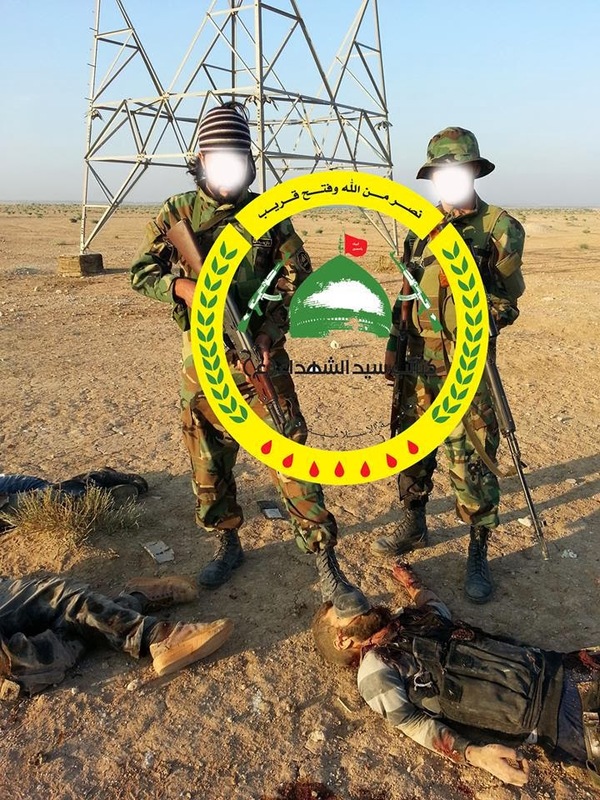 However, photographs of the executed had circulated elsewhere prior to the release of the video and to this particular photograph posted on Shia militia social media. On September 23, 2013, the same dead men were part of a post placed online by Bousla.net. At that time, it was claimed they were part of the Salafi rebel organization, Liwa’a al-Islam, and were ambushed in the rural East Ghouta region outside of Damascus. Furthermore, it was reported in the article that elements of Liwa’a Zulfiqar, a Syrian based Shia militia whose fighters primarily come from the aforementioned groups in Iraq, and work in conjunction with Lebanese Hizballah, led the attack. Elsewhere, on LiveLeak, the pictures were republished and it was added that the executed individuals were, “near jordanan border the place where the cia saudi arabia and jordanian intelligence finance and train rebels [sic]”. Figure : Three of the photos published by Bousla.net which clearly showing the executed men in the video. Most intriguing about the video and photo posts in news media (as opposed to social media), were the two sources to which this material was leaked. Both market themselves as “independent” Lebanese (as opposed to Iraqi, Iranian, Syrian, or other Arab outlets) news providers, have little original content, and do not have much of a share of an already packed Lebanese media market. Ironically, Bousla.net, the original poster of the images of those executed in the video, published a piece claiming the video was a fabrication and that Lebanese Hizballah had no role in the killings. Bousla.net also drew no connection between the original photos and the video. Figure : The banner photograph for the Facebook page featuring the execution photo in question. The title reads, “Al Muqawama” (“The Resistance”). The logos for (left to right) Asa'ib Ahl al-Haq, Lebanese Hizballah, Kata'ib Hizballah, and Kata'ib Sayyid al-Shuhada are shown on the poster with the golden dome for the Sayyida Zaynab shrine in Damascus. Iranian Supreme Leader Ayatollah Khamenei is shown prominently in the left. The dates these photographs were posted, their higher resolution (when compared to the video), the source(s) which published the information, and the utilization of the same bodies, conclusively establish that a Shia Islamist militia—most likely involving Hizballah, was behind the killings. The publishing of the photographs and the leak of the video of the killings further symbolize a new and carefully coordinated social and traditional online media campaign to show Syria’s rebels that Iranian-backed groups will resort to brutal means to win in Syria. Uploaded onto YouTube on October 8, 2013 was a 1 minute and 40 seconds long video claiming to show members of Lebanese Hizballah brutally executing, “wounded Syrians”. 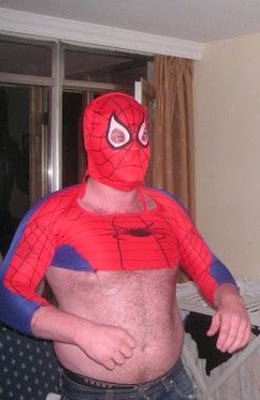 The film was shocking for more than its sadistic contents. Accusations of Lebanese Hizballah carrying out massacres and executions have been part and parcel of the pro-Syrian rebel narrative for some time. Yet, despite claims of that variety and daily doses of ultra-violence pouring endlessly onto the web for the past two years from pro-rebel and anti-Assad sides of the spectrum; little, in terms of videotaped human rights violations by Hizballah or by their allied Syria-based Iraqi Shia militias, could be found online. Owing in large part to these groups’ Iranian-proxy status and clear religiously-based order, the aforementioned Shia Islamist organizations function in a far more militarily professional manner. Additionally, Lebanese Hizballah and their Iranian-backed Iraqi cohorts, operate advanced messaging and propaganda initiatives. In turn, this has allowed for them to successfully present their narratives and images to a wide audience. Furthermore, there has been some criticism regarding the veracity and authenticity of the video clip. In part this is due to claims that the audio for the clip could not be verified and may be taken from other sources. Nevertheless, after close analysis, this clip may be the first substantial video evidence demonstrating Lebanese Hizballah and/or other Shia militia (primarily staffed by Iraqis) groups in Syria of conducting blatant human rights abuses. Uniforms, headbands, and ribbons worn by the fighters. The discussion of Iranian revolutionary concepts adopted by Hizballah. Trends in Hizballah and among fellow Iranian-backed Shia Islamist groups for filming and photographing dead rebels. Assessing where the video originated. An increase in the posting of brutal images featuring dead rebels by Shia Islamist groups in Syria. Said by another person (possibly the cameraman or a fighter to another fighter. Even added to the video’s context it can be viewed as a compliment or as sarcasm): “You’re a tough one.” (1.05-1.06) (some have speculated that the accent used is Syrian, still this section of speech is not definitive enough to be deemed Syrian). Found on some pro-Assad and pro-Hizballah websites was a piece criticizing the movie by Mr. Ahmed M. Yassin. In an interesting twist, the author blames the Syrian army and/or the National Defense Forces (a Syrian state-supported militia-style group trained by Iran and Hizballah). He also correctly states that the actions of those in the video would constitute a war crime. Yassin starts out by saying the radio transmissions are taken from a clip involving Hizballah fighters in Qusayr and their headquarters in May, 2013. These clips were provided in the article. When compared, it is extremely hard to tell whether there is any credibility to this criticism. Additionally, if the radio traffic was faked, that would necessitate the other audio sections were also added later. Still, the author does not come to this conclusion. Plus, the audio tends to match with the actions seen in the film. Yassin added to this by claiming the uniforms seen in the video do not match the type worn by Hizballah. According to the author, this was due to the green and brown colors not being as “dark” as some previously utilized by Hizballah. An example from the 2006 Hizballah-Israel War is offered as supporting evidence for this claim. Additionally, the author also claims that the pants are not the same as those Hizballah. However, rationally speaking, it’s not hard, nor is it unheard of fighters (in professional or paramilitary organizations) altering their uniforms. (See explanation covering uniforms used by Hizballah and other Shia militias below). The piece also stated that “fi sabil Allah” would not be used by an ideologically educated Hizballah fighter in the context of “killing” (a term used during the film) for Allah. Only “fighting” in a justified and sanctioned war for Allah (see explanation below regarding this phrase). Though, this minor linguistic distinction appears to be more about splitting hairs, rather than establishing the statements made in the video as spurious. Where Did the Video Come From? The clip was first uploaded to a YouTube account belonging to a website called NewLebanon.info. This site appears to present itself as a more independent (as opposed to being tied to the main Shia parties, Hizballah or Harakat Amal) Shia-oriented news provider in Lebanon. After the video was posted, NewLebanon.info published a piece defending its authenticity. In it, they argued that even if the audio was added later, defenders of Hizballah had no explanation for the material shown in the video. This form of defense also leaves holes for further criticism, particularly regarding the images presented in the video. Essentially, NewLebanon.info’s case rests on the assumption the fighters shown were Hizballah members. However, with the little information available, sans audio, it would be impossible to confirm whether the fighters were from Hizballah or not. Some viewers of the video have come to the conclusion that the fighters shown in the clip must be Hizballah members due to the presence of yellow ribbons tied to their battle fatigues. While this sounds like an argument based on an odd piece of minutia, Syrian rebel groups, their supporters, and onlookers have repeatedly stated that yellow ribbons are a clear identity marker for Hizballah members in Syria. 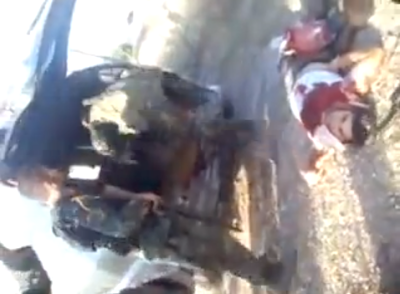 Additionally, one of the fighters in the video is wearing a green headband as he drags wounded and possibly dead bodies from the back of a van. This may be another sign he may belong to a Shia organization. It is true that the variety of Shia militia groups backing the Assad regime have been photographed and recorded wearing plain headbands or those featuring religious slogans (most often, they are colored black, green, red, or yellow). Additionally, there is quite a lot of history of yellow ribbon decorations symbolizing Khomeinist causes. In the early 90s, Iranian protesters would go to Mecca and protest the U.S. and Israel wearing their yellow ribbons and bands. More recently, Hizballah fighters have also been recorded in Syria with yellow-ribbons tied to their uniforms. In Lebanon, the group used yellow-ribbon wearing street-toughs when intimating and attacking their Shia opposition. Members of the Iranian-backed Iraqi Shia groups, Asa’ib Ahl al-Haq and Kata’ib Sayyid al-Shuhada, often feature their fighters in Syria wearing these types of adornments. Liwa’a ‘Ammar Ibn Yasir (see videos marked: “LAIY Fighters With A Captured Rebel & Engaged In Combat” and “LAIY Fighters Record Syrian Rebels They Killed”), another Shia militia group formed primarily from Asa’ib Ahl al-Haq and Kata’ib Hizballah members, has also been filmed with their members wearing green headbands featuring Shia religious slogans and yellow ribbons. 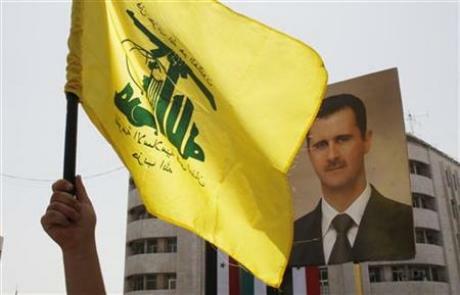 The emphasis on these color combinations has roots which trace back to Hizballah’s official party colors, yellow and green, which are featured on the group’s flag (though, in most occasions, yellow is more normally associated with Hizballah). Green also finds its place into the color spectrum of Shia Islamists since it is the color of Islam and the Ahl al-Bayt (the descendants of the Prophet Muhammed to whom Shia pay special devotion). While markers such as these serve as interesting circumstantial evidence pointing to Lebanese Hizballah involvement, they are hardly enough to establish that fighters from Hizballah or Iraqi Shia militia members were in the video. Shia militia groups operating in Syria and militias directly controlled by the regime of Bashar al-Assad have donned many different styles of colored ribbons as identity markers. Members of Liwa’a al-Imam al-Hasan, a primarily Iraqi Shia militia which operates in conjunction with Hizballah in Rif Dimashq, has been recorded wearing red and yellow ribbons. Assad’s own Ba’ath Party militia, Kata’ib al-Ba’ath and the National Defense Forces have also been shown wearing red (in an ironic twist, the video link actually has a Lebanese Hizballah song playing in the background) and yellow ribbons. Ribbons and headbands aside, there is also the issue of the taped fighters’ uniforms. The pattern, appears to be modeled off of or an actual U.S. M81 Woodland Pattern Battle Dress Uniform (BDU). 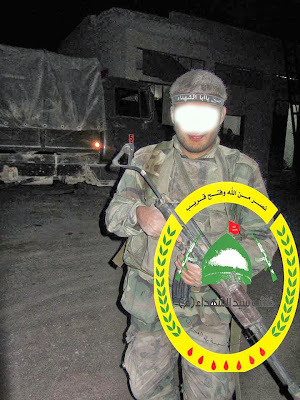 This uniform type is seen quite regularly on Lebanese Hizballah members and with other Shia militiamen operating in Syria. Additionally, Woodland Pattern types are widely available across the Middle East. Hizballah’s main backer, Iran, has even manufactured its own varieties. This style of uniform is also commonly worn by Hizballah and other Shia militias fighting in Syria. Figure : Lebanese Hizballah’s Mahdi Yaghi. His death in Syria was announced on October 1, 2013. Note his woodland pattern-style uniform and the headband. 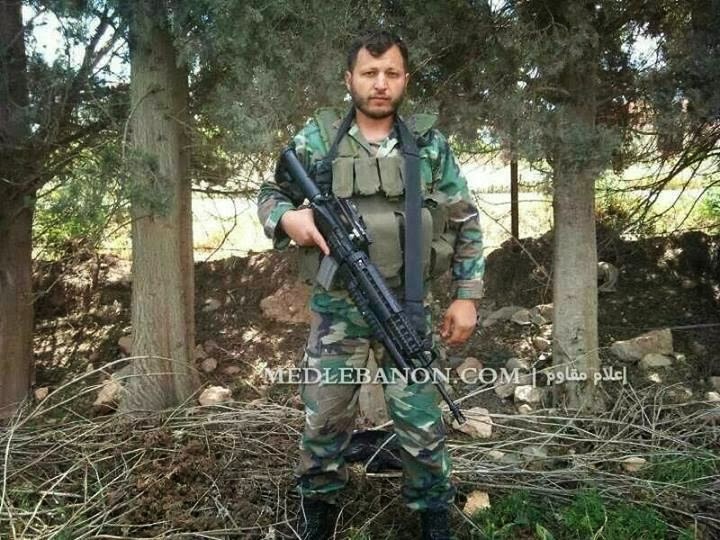 Figure : A Hizballah figher who was kiilled in September during a fight in Ba'albek, Lebanon. He too wears the woodland pattern-type camouflage. Throughout the clip, “In the path of Allah” (“fi sabil Allah”, also transliterated as, “fi sabillah”) is said a number of times, underlining a religious message from executioners. In the context of the video, the phrase is used as another religious justification for the killings. While this phrase is important for Sunni and Shia Muslims alike, particularly those waging jihad, it has a special place in Hizballah propaganda and in the party’s background. One of Hizballah’s earliest songs, “Ya Aba Abdillah”, repeats the phrase as part of the lyrics. When Hizballah’s “martyrs” have been announced, the slogan finds its way into online commemorations. As a long-arm for Iran’s Islamic Revolution, the group itself is also cast as following “in the path of Allah”. Thus, the “Party of Allah”, is presented as executing his will on earth. One of the filmed Hizballah members pauses to state the goals of the executions and possible chide another fighter who kicked a prisoner. In a very clear Lebanese accent he states, “We are performing our taklif and we are not seeking personal vengeance”. The mention of performance of a taklif is one of the most important sections of the video demonstrating these fighters likely originated from Hizballah. 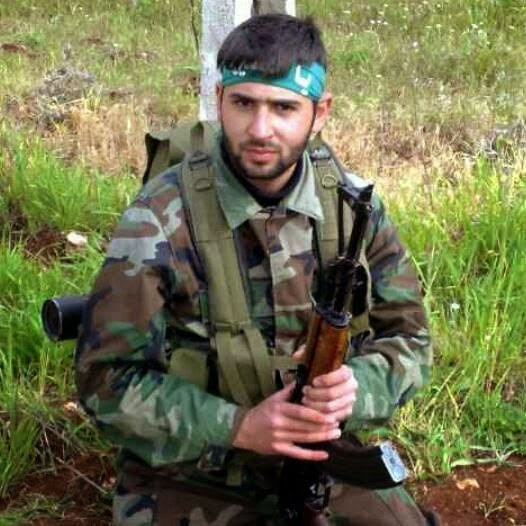 In a June USA Today article which covered Hizballah’s involvement in Syria, a Hizballah fighter noted, "Everyone who is sent to fight in Syria has received a 'Taklif Sharii'". USA Today added the taklif sharii is “a religious command that means he will go to heaven if killed.” Nevertheless, the taklif sharii is more than just a religious edict which guarantees a martyred fighter’s spot in heavenly paradise. It is a religious obligation put forth by a cleric and must be followed. In fact, it is a form of religious ruling which underpins the Khomeinist ideology guiding Iran, Hizballah, and all of the main Iraqi Shia organizations sending militiamen to Syria. Augustus Richard Norton noted that Hizballah’s adherence to taklif sharii is a theological legal ruling, “as though commanded by Allah”. According to Mohammed Sherri, an Al-Manar (Hizballah’s official TV channel) commentator, “once a taklif is issued, violating it is similar to any sin, like murder or adultery, or not praying or fasting.” In traditional Shi’ism, the taklif sharii was rarely issued and normally did not deal with political issues. The concept was actually revived as an important Shia idea by the father of Iran’s Revolution, Grand Ayatollah Khomeini and as an important support for his form of clerical rule, Wilayat al-Faqih (in Persian it’s known as Velayat e-Faqih). In effect, the issuing of a taklif sharii by a high ranking Shia cleric, in this case Iranian Supreme Leader Ayatollah Khamenei—The “Spiritual leader” of Hizballah and the other Iraqi Shia groups, is a direct order coming from Allah. Prior to and during the Iraq War (2003), Iran facilitated the creation of so-called, “special groups” and political organizations loyal to Wilayat al-Faqih. Hizballah is also a firm supporter of the Wilayat al-Faqih ideology. Iraq’s “special groups” of yesteryear are now fully formed political and militant organizations. Included among these organizations are Iraq’s Asa’ib Ahl al-Haq, Kata’ib Hizballah, the Badr Organization, and Kata’ib Sayyid al-Shuhada—All suppliers of Shia fighters to Syria. Journalist Nicholas Blanford notes that new Hizballah members, “absorb the principles of the Islamic revolution in Iran, obedience to the wali al-faqih [the head of an Islamic state, according to the system of wilayat al-faqih, which holds that the preeminent religious authority should be the supreme ruler]”. The same is true for these Iraqi Shia fighters who cooperate with Hizballah in Syria. All of these organizations received a takif sharii from Iranian and higher-level local clerics to fight in Syria. Thus, this concept’s appearance in the clip’s dialogue underlines that the fighters are not simply “Shia volunteers”, but ideologically trained fighters. Ideology is not the only factor pointing to Hizballah’s involvement in the video. Staged photographs featuring dead rebel fighters is also hardly a new form of propaganda for Hizballah and allied Shia Islamist organizations. In fact, a prominent face for Hizballah “martyrdom” in Syria, Hajj Ali Jamal al-Jashi (A.K.A. Haidar) was filmed prior to his death (announced in April, 2013) posing next dead rebel fighters (it’s important to note that the footage seen after Jashi is shown supposedly comes from a Hizballah “night time ambush” in Syria in September). The message presented is clear, the rebels are being “punished” (a common term on Shia militia social media on captions for dead rebels) for daring to oppose the “Resistance” of Hizballah and its allied regional organizations. Still, Hizballah and their social media sites do not often post the more graphic varieties photographs of dead rebels and has rarely posted photographs of its fighters with the dead. Nevertheless, this is not the case for other Iraqi Shia organizations fighting in Syria and the posting of these types of photos onto Shia Islamist social media has been an increasing trend. The executions also bear a striking resemblance to photographs released by other allied Shia militia organizations. In some respects, it can be argued that Kata’ib Sayyid al-Shuhada has almost fetishized the posting of gruesome photographs of dead rebels, at times featuring piles of dead, and of their own fighters posing with the bodies (see the section marked, “Gruesome Uploads: KSS Promotes Their Kills”). Nearly 20 percent (37) of the 207 photographs posted by Kata’ib Sayyid al-Shuhada’s official Facebook page are of dead rebels. 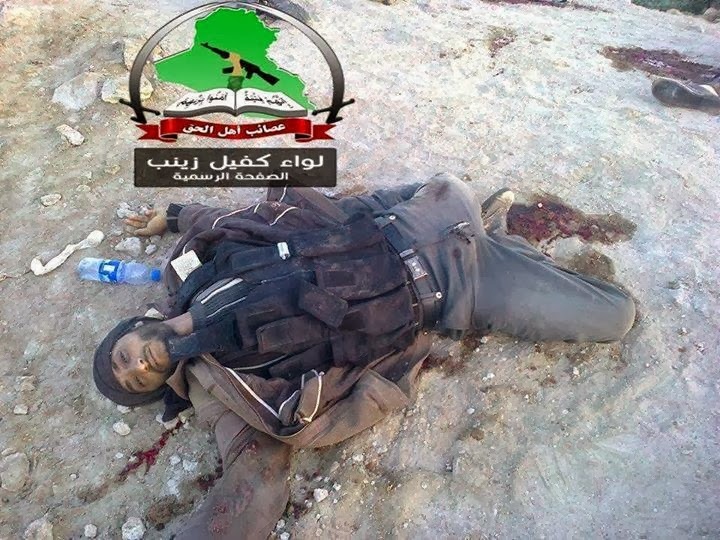 Asa’ib Ahl al-Haq also occasionally posts photographs of dead rebels. 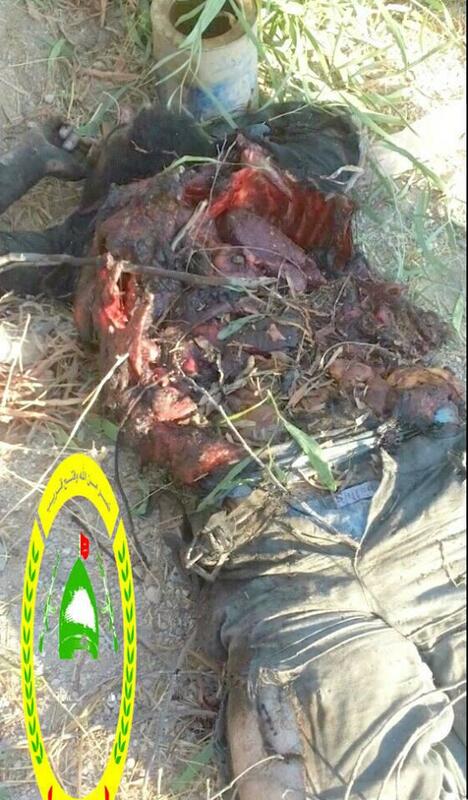 In April and May, Liwa’a Abu Fadl al-Abbas also posted graphic photographs of their dead enemies. These same pictures have circulated around social media circles which promote Shia Islamist militias in Syria. Since piles of dead bodies are often photographed together in open fields and other areas, it can be assumed they have been piled there and then photographed. This allows for Hizballah and their allied organizations to issue a more effective message. With these photos, they can bluntly demonstrate they are having success in the field and that they have contempt for their enemies. Figure : This photograph purportedly shows a member of Liwa’a Abu Fadl al-Abbas stepping on the head of a captured Syrian rebel. The picture has circulated on pro-Shia militia social media pages since April. 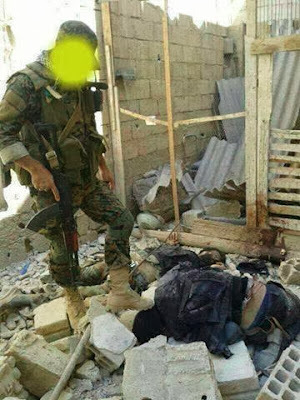 Figure : Another photograph posted in April supposedly showing Liwa'a Abu Fadl al-Abbas members standing over a dead rebel. This is a newer version of the photo with a new logo posted in the upper-right corner. 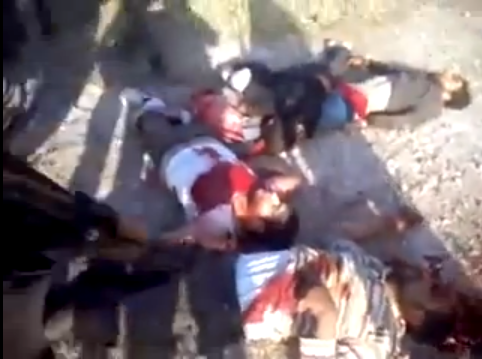 Figure : Two Kata'ib Sayyid al-Shuhada militiamen pose with the bodies of dead rebels. One of the Shia militiamen has his boot on the face of a dead rebel. 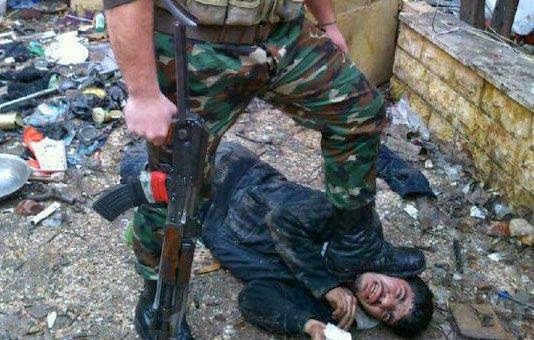 Figure : Another photo supposedly showing a Shia militiaman with his foot on the body of a "Nusra Front terrorist" in Damascus. 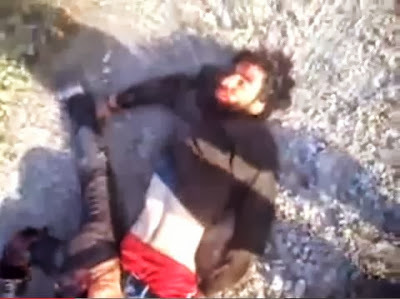 Extremely graphic - Figure : A Kata'ib Sayyid al-Shuhada photograph of a rebel with his ribcage blown open. The caption for this picture included a, "Hahahahahaha". Figure : Asa'ib Ahl al-Haq's Liwa'a Kafil Zaynab (AAH-LKZ) posted this and a number of photos featuring killed rebels and using them as examples of AAH-LKZ’s combat effectiveness. 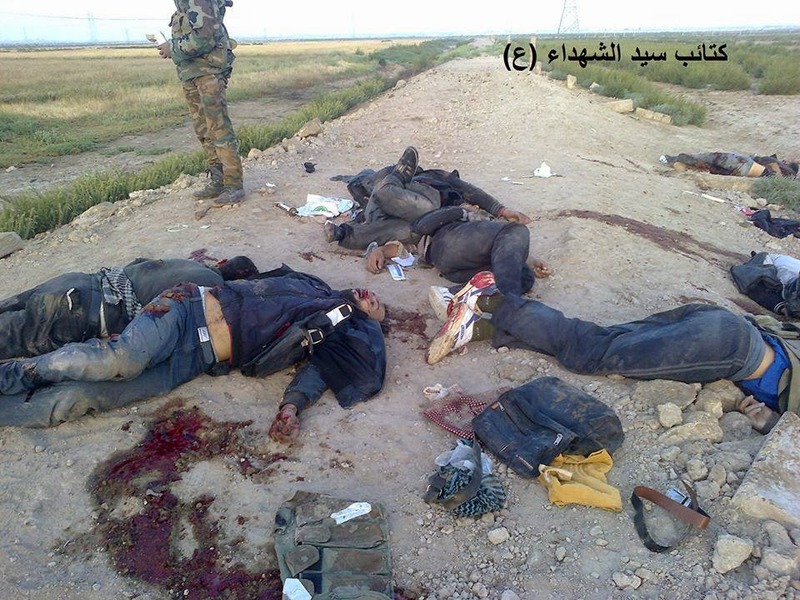 Figure : A photo of dead rebel bodies from a pro-Shia militia Facebook page. The picture is credited to Kata'ib Sayyid al-Shuhada. However, it has been posted by other Shia miitia groups. Attempting to conclude which organization the militants in the video came from, based simply on their uniforms and ribbons, is a futile exercise. This is particularly the case in Syria where weapons systems, uniforms, and a wide variety of equipment can and has easily traded hands. However, when placed in a wider context with the fighters speaking in Lebanese accents and discussing important Khomeinist ideological concepts (which are of key importance to Hizballah) helps establish the possibility that fighters from Hizballah were involved. Since Hizballah and its allied organizations have taken to posting brutal imagery, featuring piles of dead rebel fighters, the clip may have shown what could have been a prelude to posts of that nature or another example (this time, involving Shia fighters) of a heightened level of brutality present in Syria. Unfortunately, as with many YouTube clips emanating from Syria, more evidence is needed to make a definitive calls about the clip in question. Though, based on the large amount of circumstantial data, it is highly likely these were Hizballah fighters executing a number of men. The northern border town of Azaz in Aleppo Governorate recently came to the forefront of media attention in light of clashes in the town between the Islamic State of Iraq and ash-Sham (ISIS) and the local FSA-banner battalion called Northern Storm. So what is the full story behind this conflict? The ISIS presence in the town can be observed as far back as the beginning of July, when I detailed ISIS’ expansion into rural northern Syria with particular focus on border areas. At the time, the entry of ISIS members with an apparent intention to establish headquarters in Azaz provoked both protests and counter-protests. While I doubt the claim that neither Ahrar Azaz nor the Azaz Media Center was aware of the meaning of the banner, one can accept the idea that they were not pro-ISIS but at the same time not initially against the group’s entry into Azaz. Indeed, on 31 July, Ahrar Azaz shared a statement put out by the Azaz Media Center, indicating that ‘we- the Azaz Media Center- are not affiliated with any brigade or battalion.’ In short, one can say that Azaz on the whole had mixed feelings about ISIS when it first came to the town in July, similar to the situation in other Aleppo towns like al-Bab and Manbij. Originally, so the activists behind the anti-ISIS SHA explain to me, ISIS did not have a “military presence” in Azaz. Rather, Azaz had a services office where responsibilities for providing shelter and medical treatment were entrusted to ISIS members, who also used the office as a means to engage in da’wah outreach to the local population. That ISIS was able to establish itself in Azaz initially through provision of services comes as no surprise. 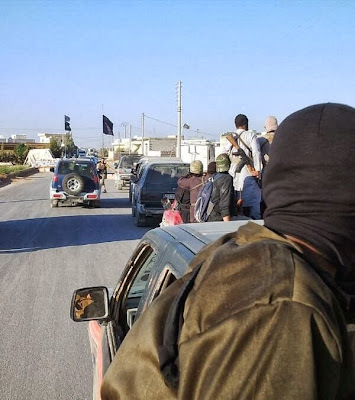 As I have documented elsewhere, the group wields significantly greater financial clout than other rebel factions and can thus more readily provide aid to locals, even as the extent of social services do not quite match that of the other al-Qa’ida affiliate in Syria Jabhat al-Nusra. The strategy of building support through da’wah, it should be noted, is a standard tactic of ISIS. Below, for example, are two scenes of recent da’wah outreach by ISIS, one from the Aleppo town of Manbij, and another from Raqqa. 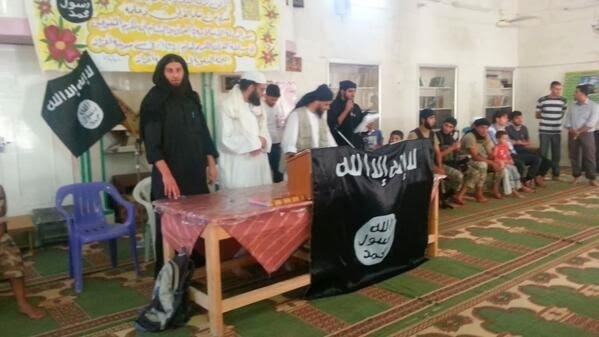 During Ramaḍān, ISIS in Azaz offered contests in Qur’an and Sunnah recitation. In late August, a photo emerged of ISIS outreach to locals in their da’wah office in Azaz, again on the basis of Qur’an recitation (Figure 3). It thus appears that so long as ISIS was trying to build its presence in Azaz through da’wah, there were no major problems in daily relations in Azaz between ISIS and Northern Storm, who had cooperated in the takeover of Mannagh airbase that was ultimately led by ISIS. ISIS’ military presence, my activist sources inform me, only came about through reinforcements sent to Azaz when “the problem happened”: namely, the dispute in mid-September between Northern Storm and ISIS over a doctor of German citizenship working in Azaz. According to ISIS supporters, the man was actually working as a spy and taking photos of ISIS’ headquarters in Azaz. Northern Storm fighters not only allegedly helped this man take photos and escape but also killed two members of ISIS when ISIS tried to arrest him. It should be noted though that the local hospital in Azaz released a statement after the clashes broke out, denying that he had been taking photos of ISIS’ headquarters. Rather, his photography was solely concerned with taking photos of the sick being treated in the hospital. In any event, ISIS proceeded on 18 September to send in military reinforcements, and then besiege and storm Northern Storm’s HQ, taking dozens of prisoners in the process. At the same time, the head of Northern Storm’s Azaz press office was assassinated by ISIS (Hazim Azizi), and Azaz Media Center’s crew members in the town were taken prisoner. On the other side, Northern Storm received reinforcements from its own rank-and-file elsewhere, as well as from low rank fighters in some other FSA-banner brigades, most notably Liwa al-Tawheed (LAT), whose leadership entered Azaz in order to negotiate a compromise between ISIS and Northern Storm. In general, the LAT leadership in Aleppo governorate has enjoyed good relations with ISIS. In August, both ISIS and LAT in the Jarabulus area were signatories to a joint statement denouncing the Kurdistan Workers’ Party (PKK)- seen as synonymous with the main Kurdish political party in Syria (the PYD)- as an agent of the Assad regime, and called for the necessity of cleansing the highway between Manbij and Hasakah of the PKK checkpoints. 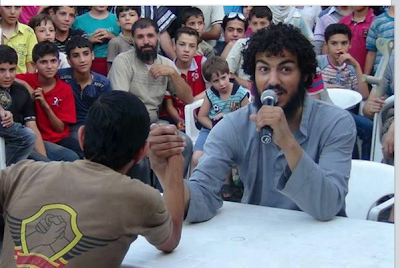 In a similar vein, below is a snapshot of a friendly arm wrestling match between an ISIS muhajir and an LAT fighter as part of a family day of fun organized by ISIS in Aleppo. Though local activists reported that negotiations between LAT commanders and ISIS were breaking down at around 5:00 p.m. local time on 19 September, LAT eventually brokered a compromise between ISIS and Northern Storm, whereby ISIS was supposed to withdraw from Northern Storm’s headquarters within 48 hours, and both sides should exchange all prisoners within 24 hours. Further, all disputes should be referred to the Shari’a committee (in Aleppo) and LAT was to enforce the ceasefire agreement by setting up a checkpoint in Azaz to prevent further clashes in the town. As per the agreement, ISIS released nine prisoners in its custody, but on 22 September, Northern Storm issued a statement accusing ISIS of not adhering fully to the terms of the agreement, stating that the group had not released all its prisoners, among them an activist for the Azaz Media Center by the name of Mohammed Nour, an accusation also affirmed by Ahrar Azaz, which noted that ISIS had not released all detainees despite a time lapse of more than 60 hours. In response, ISIS released a statement on 23 September with a number of accusations against Northern Storm, including helping members of regime forces to escape Mannagh airbase, supporting the ideology of democracy, collaboration with security firm Blackwater, American intelligence and Senator John McCain, defending a German spy, and banditry. One should also note that the statement refers to the town as their ‘emirate’- a term ISIS also applies to its northern border stronghold of Jarabulus. Evidently, ISIS had no intention any longer of a power-sharing agreement or compromise with Northern Storm. Indeed, no mention had been made of ISIS’ returning of Northern Storm’s headquarters as per the ceasefire agreement. 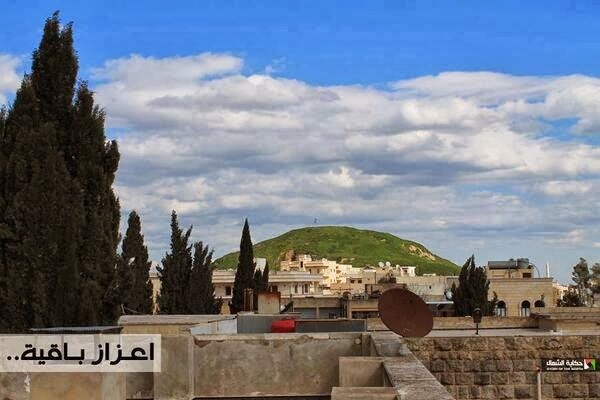 Further, it is clear that ISIS had begun to reinforce its positions in Azaz with rooftop snipers, as local activists reported the assassination of one Mustafa Ali Rajoob by sniper-fire on 22 September. The situation continued to deteriorate as some FSA-banner battalions of unspecified affiliation announced in the early hours of 24 September a ‘Battle of Nahrawan’ against ISIS- named after the fourth rightly-guided Caliph Ali’s battle with takfiri Kharijites in modern-day Iraq. This initiative was quickly dropped in fear of ISIS’ military capabilities. Meanwhile, even as photos were released of locals still in ISIS custody despite the ceasefire agreement, ISIS carried out a series of raids on homes of suspected anti-ISIS activists in Azaz, arresting three detainees whose names can be ascertained: Mohammed Janad, Mohammed Rajoob, and Yasir Salbiya. On 26 September, ISIS released a new statement giving a 48-hour deadline for remaining Northern Storm members to ‘repent’ and hand over their arms, with the deadline beginning from 8:00 p.m. local time on 26 September. On the same day, gunfire was heard in the town, indicating a renewal of conflict as ISIS sources claimed the ‘repentance’ of a number of Northern Storm fighters. It should be highlighted that this call for ‘repentance’ was issued by ISIS under the ‘region of Azaz,’ and thus applies not only to the town itself but also the surrounding countryside where some Northern Storm remnants had taken refuge. ‘Repentance’ (tawbah in Arabic) is a recurring theme in ISIS discourse, and was similarly used to refer to the defection of PKK members in Tel Abyaḍ following the PKK’s expulsion from the town by a coalition of FSA-Ahrar ash-Sham-ISIS. It would appear that activists then tried to mediate between the two groups without success, while on 29 September, a statement appeared from ISIS announcing an extension of the deadline for ‘repentance’ by another 48 hours. Even so, evidence emerged from ISIS sources of additional military reinforcements (see images below), intending to deal a decisive blow to remnants of Northern Storm still refusing to surrender. By 2 October, ISIS sources announced that the deadline for ‘repentance’ was now over, and reports emerged of ISIS subjecting Northern Storm fighters who had still not surrendered to mortar and tank-fire bombardment in the surrounding countryside. Further, ISIS sources claimed that these Northern Storm fighters were now taking refuge with Kurdish YPG militias. 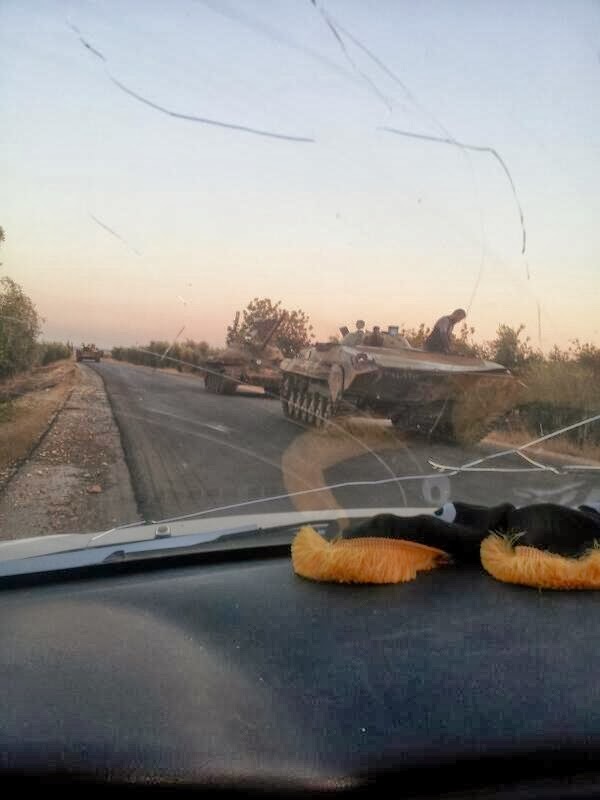 It would seem that this claim is corroborated by the fact that on 3 October, local activists asserted that the ‘Free Army’ had destroyed an ISIS tank in the village of Ma’areen in the Azaz area. However, this village is actually under the control of the YPG. The fighting continues until now, with a video released on 6 October purporting to show ISIS firing at the two YPG-controlled villages of Ma’areen and Qastal Jando. 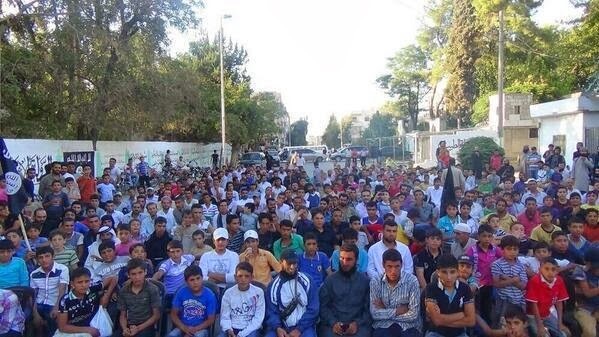 On the same day, the town of Azaz saw some anti-ISIS demonstrations, with calls for the removal of ISIS from the town. 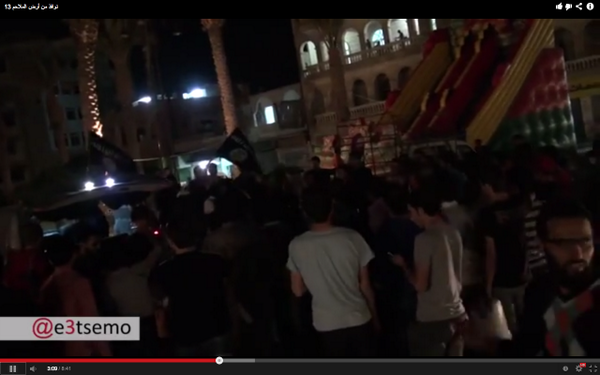 In response, ISIS appears to have used gunfire to disperse protestors. Regardless of the truth of this allegation from Azaz Media Center, it is the case that both sides corroborate the subsequent arrest of a number of individuals in Azaz accused by ISIS of being Northern Storm supporters (and they are described as such in one of Azaz Media Center’s video descriptions). A number of the signatories of the 3 October statement are members of what has been termed the ‘Islamic Coalition’ in media in rejection of the opposition-in-exile and in favor of Shari’a as the main source of legislation in a future Syria. Pace the widespread narrative such as in this Washington Post article, it is not a formal coalition of any kind and is not led by Jabhat al-Nusra, which merely saw its local representative in Aleppo sign the statement to reaffirm long-standing positions of Jabhat al-Nusra. The key to understanding the inaction lies in the decision of the Aleppo Shari’a committee, whose authority is taken seriously by ‘Islamic Coalition’ battalions like LAT, at the end of September to condemn Northern Storm as a criminal organization and bar it from bearing arms, on the grounds of spreading fitna (discord) between FSA-banner battalions and ISIS. This condemnation was no doubt partly bolstered by Northern Storm’s well-established reputation for banditry, similar to the image problem suffered by the Northern Farouq brigades, whose criminality facilitated their expulsion from northern localities like Manbij and Tel Abyaḍ. To sum up, ISIS’ seizure of control of the town of Azaz is a unilateral power grab similar to the group’s takeover of Jarabulus in mid-June, aiming to strengthen ISIS’ hold on inflow of aid and goods from Turkey. Paranoia over the activities of a man of Western citizenship may well have driven the actions of ISIS in Azaz, but the evidence more likely suggests that the dispute was a mere pretext. Second, it should not be assumed that anti-ISIS sentiment in Azaz automatically translates to support for Northern Storm, even as supporters of the latter undoubtedly exist in Azaz. What is clear at this stage is that many residents simply feel disillusioned. In fact, as the anti-ISIS SHA activists made clear from the beginning, the solution to Azaz’s problems is neither Northern Storm nor ISIS, but the withdrawal of all armed factions and reform of the local council. Northern Storm’s prior actions reflect a wider problem for FSA-banner battalions of generally non-ideological leaning in the north of the country: namely, a reputation for criminality contrasting with the outreach efforts of Islamist groups. Aware of the trends, these FSA-banner groups have tried to assert a more Islamic face, as when Northern Storm declared support for the ‘Islamic Coalition’ saying that Shari’a was its goal all along. In a similar vein, Farouq incorporated the banner of Dar al-Islam (the white flag with black Shahada) into its emblem and in its dispute with ISIS in the town of al-Bab tried to emphasize it does not support anything contrary to Islam and Shari’a. However, these efforts to regain support through a more religious image have largely proven unsuccessful. In terms of the future, it is unlikely that ISIS will be dislodged from Azaz anytime soon, at least so long as other militias beyond the YPG remain unwilling to help the Northern Storm remnants. Meanwhile, as elsewhere, ISIS understands very well that outreach to the younger generation in Azaz will be key to perpetuating ISIS’ hold on the town as a border stronghold. In short, Azaz’s fate is identical to that of Jarabulus, which saw the deposition of the local FSA-group- ‘The Family of Jādir’- by ISIS in mid-June and has remained an ISIS stronghold ever since, with a crackdown on Kurdish PYD activists in July after the ISIS/Nusra-YPG clashes in Ras al-Ayn. There is no sign of a revolt against the group’s rule in Jarabulus as it has proceeded to manage proto-state institutions such as schools for children. 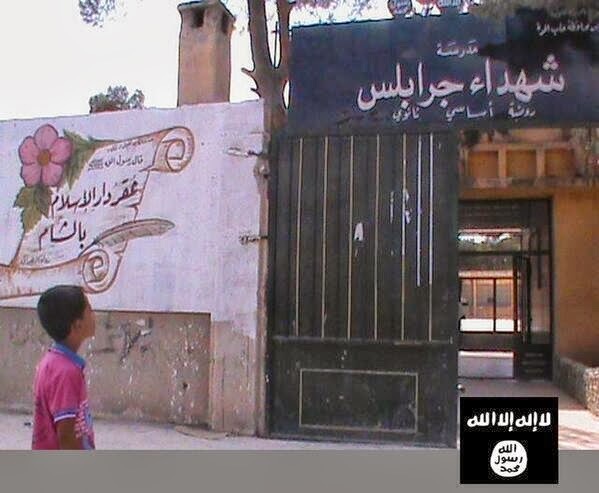 Expect photos and videos of such institutions as below to be released by ISIS from Azaz over the coming months.